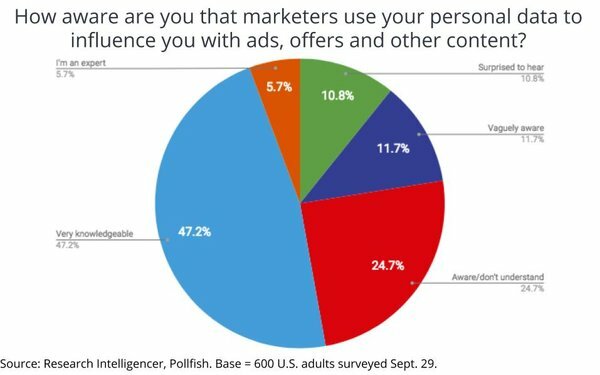 Most consumers consider themselves expert or very knowledgeable about how marketers use their personal data to influence them with ads, offers and other content, and an even bigger majority would want to manage who, when, where and why they use it. That's the finding of a survey of U.S. adults conducted recently by Research Intelligencer and Pollfish. The survey of 600 Americans 18+ found that 53% of respondents consider themselves expert or very knowledgeable about the process, while another 25% say they are aware of it, but don't really understand it. 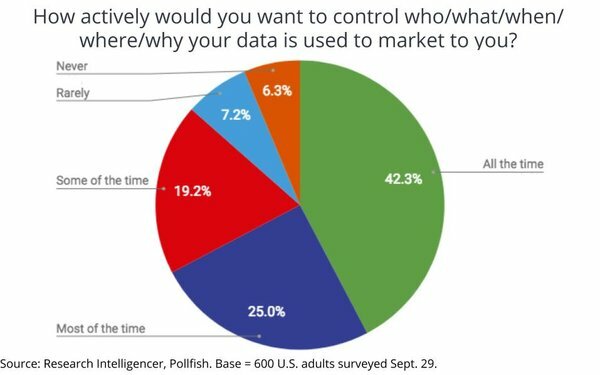 Asked how actively they would want to control who, what, when, where and why marketers use their personal data, more than two-thirds of respondents said they would want to control it all or most of the time. Research Intelligencer and Advertiser Perceptions fielded a parallel set of similar questions among ad industry executives, and we will publish those results on Monday.